Also, you may want to check your LaserJet’s settings. 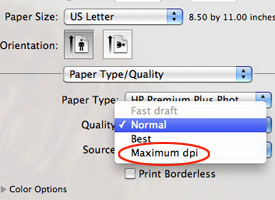 When you click the Print option within any software, you are given the choice between different quality modes. For the highest quality output, you want to make sure you have chosen Best or Maximum for the highest quality output instead of Draft or other options. Also, if your printer is in Toner Save mode this can affect the quality of documents as well. High-quality output requires good quality paper, and especially paper that is compatible with the type of printing you are doing. Make sure that your paper is designed for use with a laser printer, and that is dry, not sticking together, and is not bent or creased. For more tips on caring for paper, see our article on Preventative Paper Care. If you are experiencing smears, smudges, streaks, or other similar quality issues, you may want to try cleaning the inside of the printer. 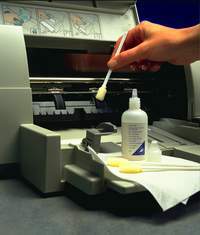 Open the access panels and check for any loose toner that might be transferring to the page, and be sure to clean the rollers. With a little luck and maybe even a little elbow grease, these tips should help you get your LaserJet output quality back up to par. If you are still experiencing problems, consult the manual or the HP Support page for specific troubleshooting based on the exact issue you are having.